Echinacea pallida and the prairie remnants at the Far Overlook, Pleasant Valley Conservancy. We have three Overlooks at Pleasant Valley Conservancy (East, Rocky, and Far), and all three have prairie remnants. 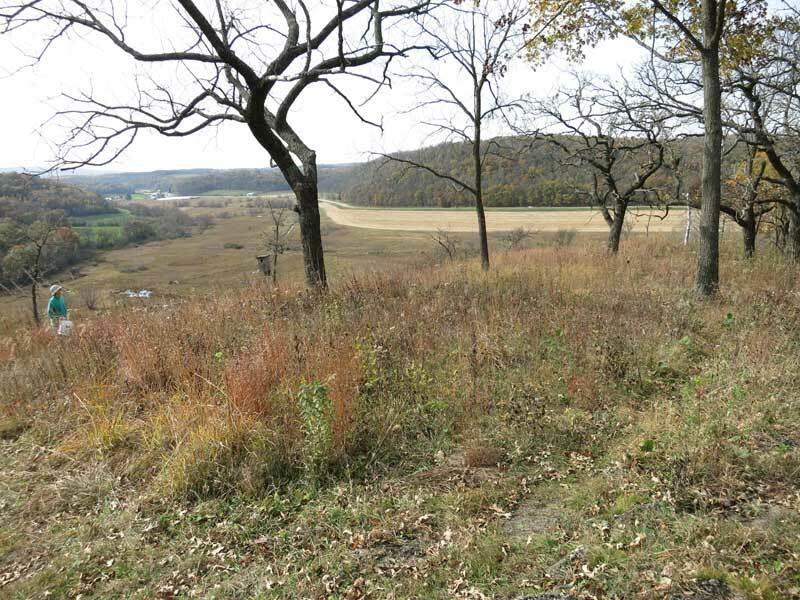 The “Far Overlook” is the most interesting because it opens out into a wider area of prairie remnants. (The bench here is heavily used.) 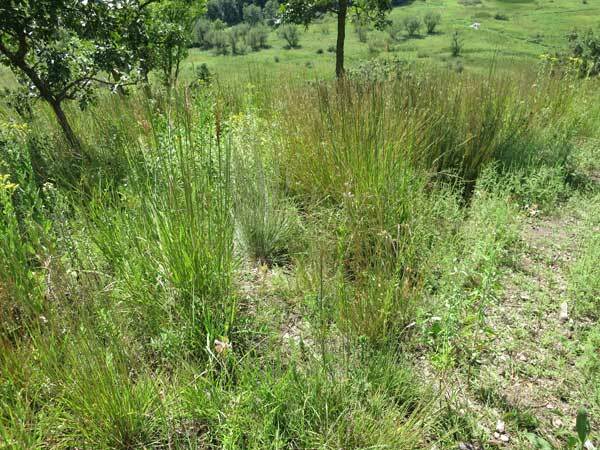 Although these areas have been planted, they also had prairie species present before any planting was done. Unfortunately, it is hard to know at this late date which species are native to the site and which have been planted. We cleared this area in 1999-2000 at the same time we were clearing the nearby savanna called Unit 8. Actually, the far west end of Unit 8 was also prairie remnant, and would be included as part of the whole remnant except that the lane to the bench passes between Unit 8 and the rest of the remnant. In the original clearing we dealt with lots of brush (honeysuckle, buckthorn, etc.) and walnut and other non-oak tree species. 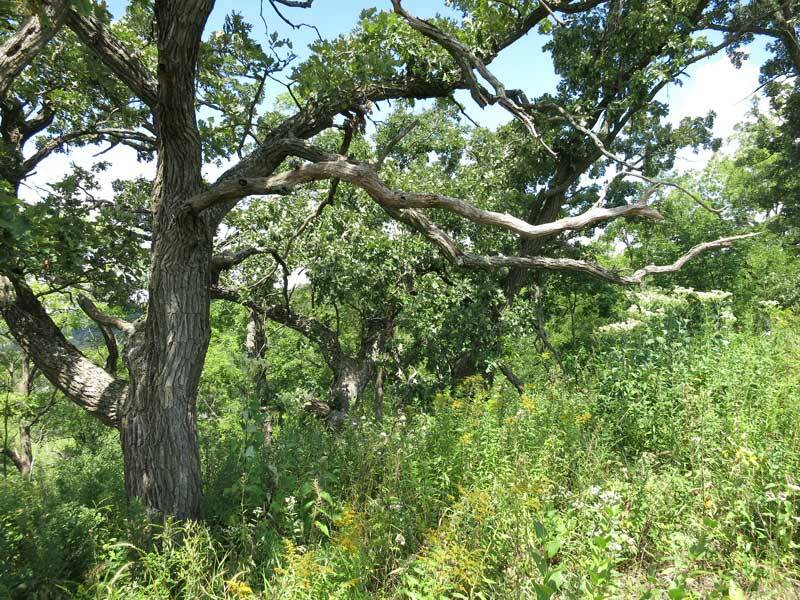 The bur oaks, of course, were untouched, and those along the ridge and a bit down the north side are spectacular, some of the oldest at PVC. Looking into the bur oaks at the edge of the Circle remnant. We call the flat area above the Far Overlook “The Circle”. For some reason, the large walnut in the center of the Circle was not removed in the initial clearing, perhaps with the idea of providing a bit of shade for visitors. Far Overlook and the Circle before removal of the walnut and black oaks in the winter 2015-2016. Late October 2015. The color is mostly due to little bluestem. Amanda felt, rightly, that this walnut did not belong there and in the late winter of 2015-2016 she and her crew finally cut it down. At the same time, a substantial black oak and some smaller black oaks were cut, leaving this area now completely open. This summer this whole area looks spectacular, providing great justification for the hard work of Amanda’s crew last winter. The Circle and Far Overlook in late summer 2016. Lots of Echinacea pallida. Note also the big bur oaks at the edge of the ridge. Typical bunch growth of warm season grasses. Visible is little bluestem and Indian grass. 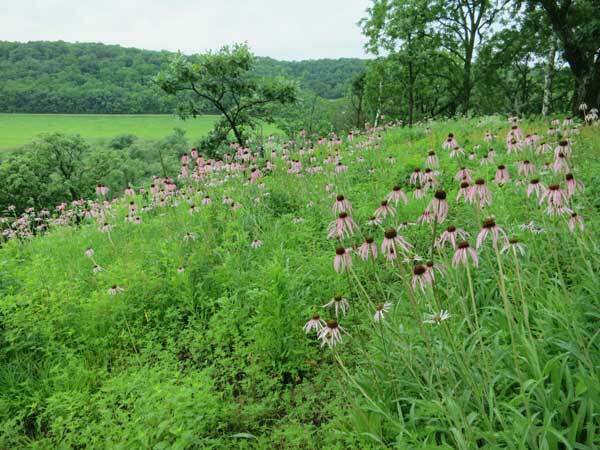 One species that has done especially well here is Echinacea pallida, which started out as a few plants (originally from seed) at the top of the south-facing slope (Unit 5A), and has spread extensively on its own. This species is known to self-seed very well and we obviously have here an ideal habitat for this species. Typical Echinacea pallida in the Overlook and Circle. Yesterday I did a survey of the E. pallida area and found lots of new plants coming up, probably from adjacent root stock. (See photo below.) This is a species that thrives especially well in dry areas. According to the seed company brochures, it doesn’t “like” too much water. of the ground. Almost certainly not from seed, but from underground rootstock. 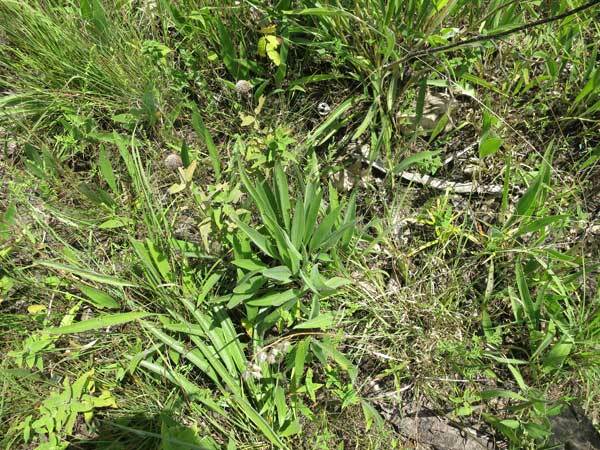 Although E. pallida is considered Threatened in Wisconsin, it is very easy to grow. 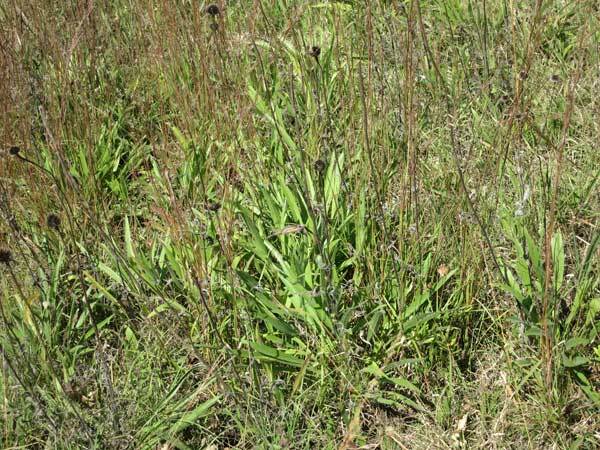 In fact, it is used so widely in prairie seed mixes, that it is almost impossible to know where “native” populations are present. The Wisconsin State Herbarium shows only four collections in Dane County and only two in Iowa County. Two of the Dane County collections were in the 19th century (1885 and 1894). I suspect that E. pallida is so common now that no one bothers to make Herbarium submissions. Because it is a Threatened species, the Herbarium website withholds the exact locations of these collections. Added on September 27 2016. The good fall rains have led to lots of leaf growth and encouraged the roots. Next year's plants should be large and healthy. 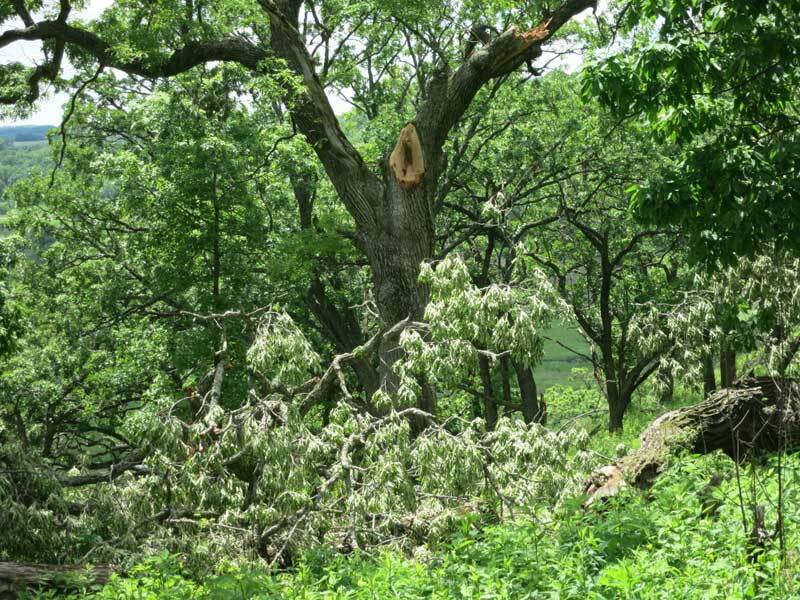 Windthrow in oak savannas: an important factor in maintaining the savanna habitat? Although the term “savanna” has been defined in various ways (Scholes and Archer, 1997), for the present discussion a savanna is considered a wooded area with herbaceous groundlayer (or understory) in which the trees are sufficiently far apart so that they are open grown (Leach and Givnish, 1998). Note that this definition specifically does not mention grass as the groundlayer, although most savannas have an extensive grass component. The origin and dynamics of savannas have been subject to extensive discussions throughout the world. Disturbance factors are generally considered to be essential for the creation of savannas, of which the most important factors mentioned have been climate (weather), herbivory, and fire. Windthrow is generally not mentioned for savannas, although it is extensively discussed in the forestry and silviculture literature. 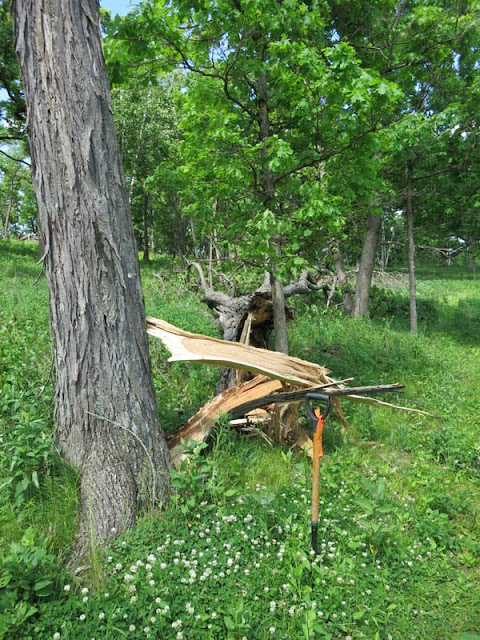 In this blog post, I would like to report on a number of windthrow events in the bur oak savanna at Pleasant Valley Conservancy and suggest that windthrow may be an important factor in maintaining the open character of the oak savanna. Windthrow at Pleasant Valley Conservancy. Over the approximately 20 years that we have been monitoring this area, we have lost a number of trees due to windthrow (probably no more than a few percentage). The windstorm of May 28 2016 was especially severe, and prompted a consideration of its significance. The most serious damage was at the topographic top of the west end of the ridge, as would be predicted from the data in the table. 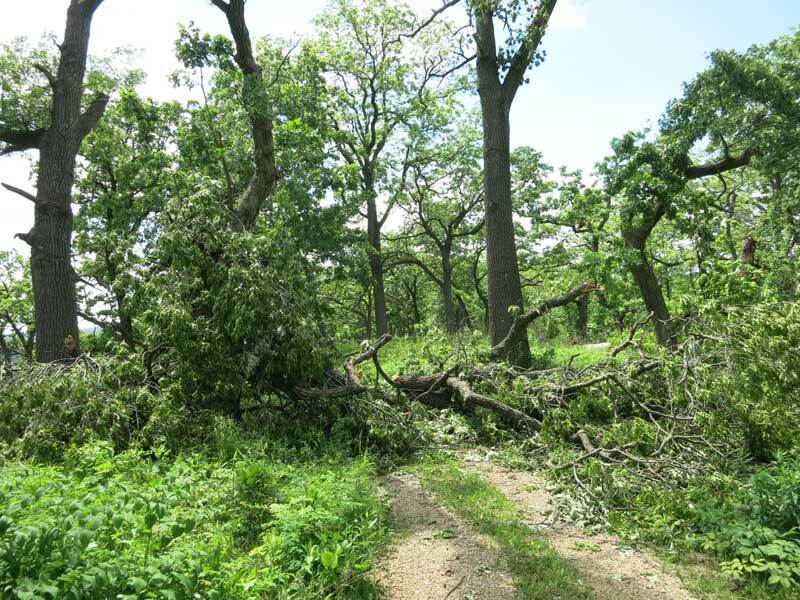 This area contains primarily bur oaks, although there were also some hickories and large black oaks that were affected (see photos below). Two fairly large bur oaks were completely uprooted, exposing their roots. These were growing in quite rocky soil at the edge of the south firebreak, and because of the geology and soil, were undoubtedly shallowly rooted. Some of the bur oaks on the top of the ridge lost fairly good-sized branches, but did not loose enough leafage to kill them. A number of hickories lost their whole tops, and will probably die. Some cherries were also lost. One very large black oak at the top of the ridge lost almost all of its top and will probably die (see photos). About 10 years ago we had a straight-line wind that took down at least five large black oaks that had died or were in the process of dying from oak wilt. Some of these still remain standing as snags, although they are gradually succumbing to fire damage. Our observation is that trees in the open, such as those in the savanna, are more likely to suffer from windthrow than trees in the closed forest in the North Woods. This agrees with the information from Steil et al. 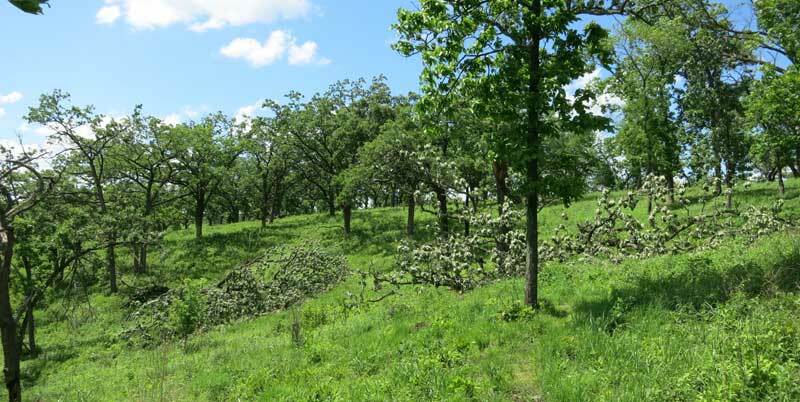 Open-grown oaks, especially those on ridge tops, are more sensitive to windthrow. Over the long life time of these savanna oaks, it is likely that some of these oaks will be uprooted or severely damaged. The bigger the tree, more likely it will be damaged by windthrow, up until the largest size. There should be a positive feedback effect. Windthrow will create openings and openings are more sensitive to windthrow. Once a portion of forest is opened up by windthrow, trees in the open will start growing as "savanna" trees. Given a long enough period of time, there may be a steady state condition, creating an open savanna habitat. Although this discussion is on oak savannas, windthrow may be significant in savannas in other parts of the world where the trees are not oaks. Most of the top of a black oak ended up on the woods road. Fortunately, the ancient bur oak nearby was not hit. This large hickory lost all of its top and will probably not survive. 100 years is about the oldest that hickories survive. This bur oak lost about half of its wood but will probably survive. Leach, Mark K. and Givnish, Thomas J. 1998. Identifying highly restorable savanna remnants. Transactions Wisconsin Academy Sciences, Arts and Letters 86: 119-128. Scholes, R.J. and Archer, S.R. 1997. 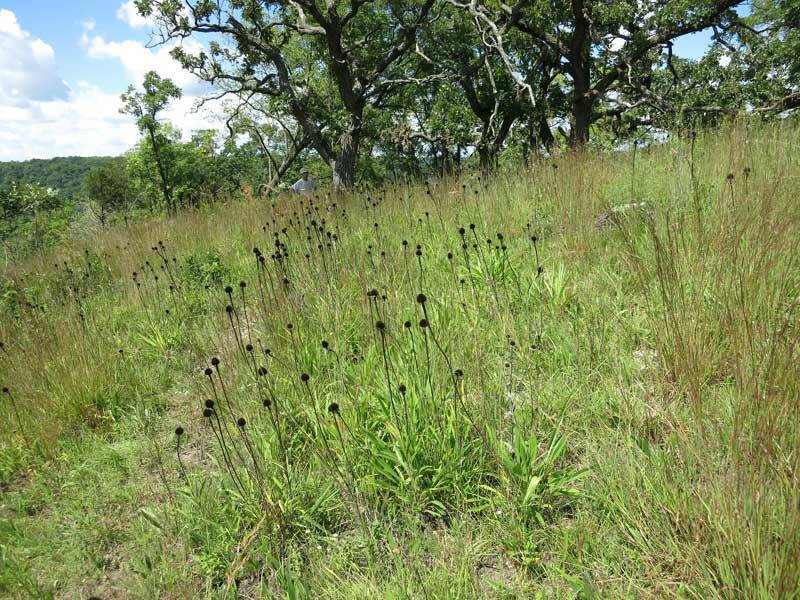 Tree-grass interactions in savannas. Annual Review of Ecology and Systematics 28: 517-544. Steil, Jeremy C., Blinn, Charles R., and Kolka, Randy. 2009. 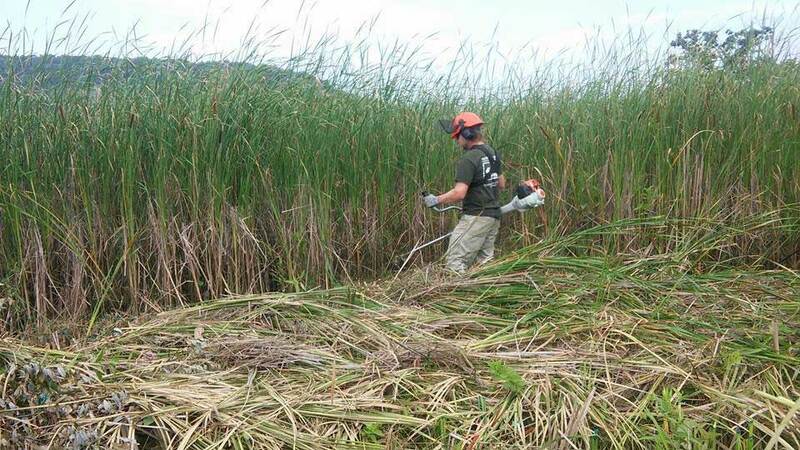 Foresters’ perceptions of windthrow dynamics in Northern Minnesota riparian management zones. Northern Journal of Applied Forestry 26: 76-82.